"Media scholar Denise Mann has gathered engaging essays that discuss the ways that television programming has changed as a result of the Internet. Recommended." --Choice "Provides tremendously valuable insights by top scholars in television studies. The essays are grounded in strong, compelling research and collectively provide a rich snapshot of the tensions, anxieties, and especially failures of this particular moment in US television's development." --Cinema Journal "This collection avoids the trap of framing itself within an easy narrative of progress or adaptive evolution. Rather, it highlights a range of responses to the disruptive influence of experimentation and the ways in which the networks have attempted to return to 'business as usual' from 2010 onward." --Journal of American Culture "Wired TV offers rich, creative, and original thinking about television's digital era. It is essential reading for anyone following contemporary media industries." 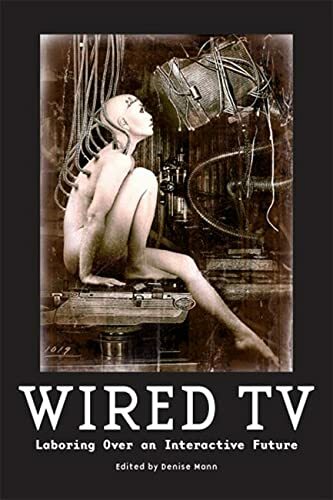 --Jennifer Holt "author of Empires of Entertainment " "With contributions from prominent scholars, Wired TV offers rigorous and exacting essays that address the dramatic shift occurring in a business that produces, sells, and resells mass entertainment." --Daniel Bernardi "San Francisco State University "
This collection looks at the post-network television industry's heady experiments with new forms of interactive storytelling-or wired TV-that took place from 2005 to 2010 as the networks responded to the introduction of broadband into the majority of homes and the proliferation of popular, participatory Web 2.0 companies like Facebook, YouTube, and Twitter. Contributors address a wide range of issues, from the networks' sporadic efforts to engage fans using transmedia storytelling to the production inefficiencies that continue to dog network television to the impact of multimedia convergence and multinational, corporate conglomeration on entrepreneurial creativity. With essays from such top scholars as Henry Jenkins, John T. Caldwell, and Jonathan Gray and from new and exciting voices emerging in this field, Wired TV elucidates the myriad new digital threats and the equal number of digital opportunities that have become part and parcel of today's post-network era. Readers will quickly recognize the familiar television franchises on which the contributors focus- including Lost, The Office, Entourage, Battlestar Gallactica, The L Word, and Heroes-in order to reveal their impact on an industry in transition. While it is not easy for vast bureaucracies to change course, executives from key network divisions engaged in an unprecedented period of innovation and collaboration with four important groups: members of the Hollywood creative community who wanted to expand television's storytelling worlds and marketing capabilities by incorporating social media; members of the Silicon Valley tech community who were keen to rethink television distribution for the digital era; members of the Madison Avenue advertising community who were eager to rethink ad-supported content; and fans who were enthusiastic and willing to use social media story extensions to proselytize on behalf of a favorite network series. In the aftermath of the lengthy Writers Guild of America strike of 2007/2008, the networks clamped down on such collaborations and began to reclaim control over their operations, locking themselves back into an aging system of interconnected bureaucracies, entrenched hierarchies, and traditional partners from the past. What's next for the future of the television industry? Stay tuned-or at least online.